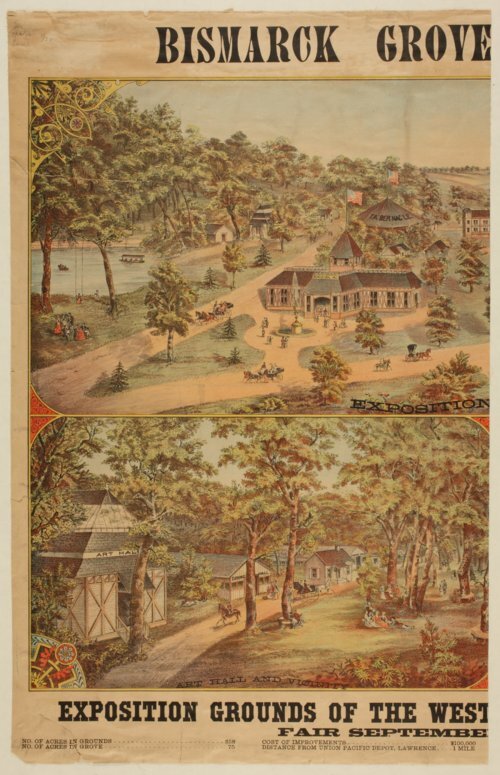 This is a colored lithograph of Bismarck Grove, Lawrence, Kansas. It served as the site of the Western National Fair Association. The upper image shows the exposition grounds including the agricultural hall, the main exhibition hall, the machinery hall, and tracks, stands, and stables for racing. The view in the lower lift depicts the "Art Hall and Vicinity." The entrance to the fair grounds, including a depot and main gate is shown at the lower right of the image. The legend at the bottom of the lithograph states that there are 258 acres in the fiar grounds, the cost of improvements was $100,000, the distance from the Union Pacific Depot in Lawrence was one mile, and the seating capacity in the Tabernacle is 5000. It also gives the distance from Lawrence to Leavenworth, Kansas City, and Topeka. Ramsey, Millett, & Hudson Lithograph, Kansas City (no state given) produced the lithograph.